Life is good! This simple idea is at the heart of a raw yoga practice. The Ancients captured this idea perfectly by calling life Zindagi, an Urdu word that captures not only the literal meaning of life as a physical experience but also the more powerful sense of the word: Life is a game of births and rebirths. We have all been here on earth many many lifetimes. In some lifetimes we were good and in others bad. Successful in some and utter failures in others. We have all killed others in one lifetime or more, violated them and then chose to have the same experiences ourselves in other lifetimes. We have all done great good as well. We have done it all and experienced it all. So why are we here? The Ancients answered that the first reason is simply that we want to be here. Face it we like it. So we come back to experience more. Secondly, we all want to learn and integrate the lessons of our learning in each fresh lifetime. This is not a linear process however. It is messy and complex but we do grow as a result of these experiences. Lastly, we come back to planet earth to try and achieve a connection with All-That-Is, the divine. Anyone can do it, at any age with any background. Yoga was created to facilitate that connection and release us from Zindagi, the game of life! 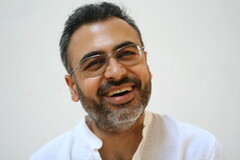 Abhay Ghiara is a life-long yoga practitioner who studied yoga and yoga philosophy at the Aurobindo Ashram and Bombay University. He now lives in Berkeley, California and teaches yoga to a wide range of students.